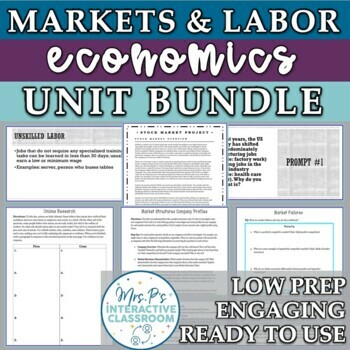 This bundle includes everything you need to teach the markets, businesses, and labor unit, including a highly engaging Stock Market Simulation Project and culminating unit exam! Just like with all my units, this one focuses on student engagement. It’s jam packed with creativity, fun, critical thinking, and varied methods for teaching students these awesome economics concepts. For every lesson, there is solid content, engaging activities, and critical thinking opportunities throughout the lessons. My philosophy is that activities should always be fun, educational, and very low prep. Therefore, there is not a lot of prep work involved in any of the lessons.